Yes please, Email it to me now. The 10 Commandments in the Bible are God’s way of showing us how to live a great and fulfilled life. 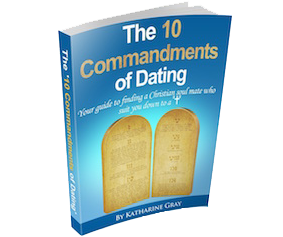 But if you’re single and wanting to find a Christian soul mate, then the ’10 Commandments of dating’ will show you what you need to do and how to go about finding that special someone. The most essential thing you need to do to be attractive to others – and how to do it! Your guide to finding a Christian soulmate who suits you down to a ‘t’. Finally, a simple ebook created for single Christians just like you who just want to meet the right person – someone who shares your faith. You’ll know that it’s not always so easy to find the right person. But that’s often because we don’t look in the right places, aren’t looking in the right way, or most commonly are simply doing the wrong things. Finding your soul mate isn’t just about being out there – it’s about being the right person and not doing some things that are all too common. Like the 10 Commandments in the Bible, these 10 Commandments of Dating boil down to a simple list of things to do and not to do. Actually not so simple – there’s a solid chapter on each commandment. What you’ll get is …. Get the eBook by filling in your details in the form above, and find out how you too can find your perfect soul mate. Overall, this is a brilliant practical guide. It’s very inspiring and gives very good coverage of the issues relating to finding a partner. A very interesting and significant aspect is that it points out issues that could impede an individual’s chances of success e.g. lack of self-esteem, rejection, not persevering etc. Each insight is backed up with enough details and adequate support to deal with related issues. Although, I have read some similar guides this is one of the best. I would definitely, highly recommend it – it is a brilliant piece of work. I loved it. Well done. I found the guide very useful in making me stop and think about things I had forgotten about dating. I have always been a fairly positive person in that I always put on my lipstick and stand up straight when leaving the house whatever I’m feeling. But reminding me not to talk about ‘me’ all the time and listen to the other person was useful. The way the 10 commandants are used is a lovely idea and the journey through the pointers is in a logical order. Definitely ditching the list made me smile. Accepting every invitation can take you to amazing places as can doing things out of your comfort zone. What made the most impact on me was no 8. Prayer alone is not enough, you have to take action and I hope now taking more action will lead to something more. Your words at the end gave me hope and encouragement and it is a pleasure to know you. "Words of hope and encouragement"
The guide is especially useful for someone who is thinking of joining an introduction agency or who has already joined one or for people attending singles events. It has a clear layout, is easy to read in one sitting and later refer back to specific points. I would recommend the guide to single people who were serious about finding a life partner. Having said that, the points about increasing ones social circle and saying “yes” to social invitations can be valuable advice for any single person whether they wanted to find a partner or not. "For people who are serious about finding a life partner"
I found the ‘10 Commandments of Dating’ guide realistic and pragmatic, giving people clear guidelines as to how to go about attracting positive results. It addresses common patterns of behaviour and encourages one never to give up. I think other single people will find this guide very useful and it’s clear and intelligent. Fundamentally the guide has helped me to evaluate where I’m at now and I’ve now resolved not to hang about for too long! "A pragmatic way to attract positive results"
Having read through your ’10 Commandments of Dating’, and thinking back to when I nervously first started considering joining a introduction service and putting myself out there again, I think that your book is good because it goes through all the ins and outs of what to do, what not to do, and gives people an idea of where and how to get started. This guide is especially useful if you’re very new to the dating scene again after a long time and/or just starting out for the first time. I wish that I’d had this advice a long time ago. "I wish I'd had this advice before"
Thank for you for 10 Commandments. I enjoyed them. Like so much coming out of your organisation, this is not only a guide whereby a balance may be achieved, but a ‘to do’ list whereby action can be taken in order to positively change things for ourselves. "A to do list to make positive changes"